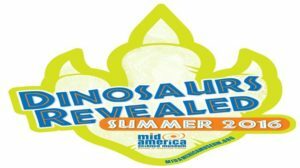 Mid-America Science Museum is happy to announce Dinosaurs Revealed as its first summer exhibit since its grand re-opening. This featured exhibit will be made up of fossils and animatronic dinosaurs and will be premiering Memorial Day weekend. On display throughout the entire summer, visitors may have the opportunity to view and even touch six full dinosaur skeletal replicas including a Triceratops, Tyrannosaurs Rex, and Velociraptor. There are additional replicas of skulls, arms, legs, eggs, footprints and a 6-foot-1 Apatosaurus femur. Visitors will also enjoy a dig box where they can use paleontology tools to unearth dinosaur bones. In addition to the fossils that will be on display from the Arkansas Discovery Network, the museum will have lifelike animatronic dinosaurs beginning in the center of the museum’s light bridge. These dinosaurs will include an adult triceratops, a Maiasaura family, a Tyrannosaurus Rex, and others which will be placed throughout galleries inside the museum. There will also be an interactive “Dino Scavenger Hunt” activity and special education stations throughout the interior and outside portions of the museum. Many of the museum’s permanent exhibitions will continue to be on display throughout the summer. New summer hours begin Memorial Day with the museum opening seven days a week Monday through Saturday from 10 am to 6 pm and Sundays from 1 pm to 6 pm until Labor Day Weekend. Visitors who would like to find out more about Dinosaurs Revealed and educational programming at Mid-America Science Museum may visit www.midamericamuseum.org or call 501-767-3461.